One of the biggest advantages of owning a house, despite the fact that you live without neighbours on the other side of the hallway, is that in most cases you have a nice yard where you can spend quality time and if the house gets small for your needs you can always expand. This is where the extension comes in mind. Depending on how big the yard is, you can make everything from one room to an entirely new second house. The most common type of extension is the single story one room. It is often used as the extra room in the house you need for a reason. The best thing about an extension is that there is really no limit as to what you should use it for. It’s a completely new room from scratch and the designer is you. One of the best purposes of an extension is a lovely summer kitchen. What better place to prepare your meals during the warm summer days. You can have lovely gatherings at the yard without having to disappear in the house every now and then to check on whether the meal is ready or if you want to take something from the kitchen. Plus even when you don’t have the gang on a gathering there is always the bonus side that you don’t need to switch on the oven inside the house and induce heat in the warm weather. Another one of the most common extension types is the extra bedroom. In almost every home there is often the need of an extra bedroom. Whether it will be a new member of the family or just the desire of having a guest bedroom, the extension will do the perfect job. Besides a room you may need, the extension can also be used for fun. You can create your own game room, fitness, lounge room or any other pleasure room that comes to mind. Probably the best thing about an extension is that you get a lot more house for a lot less money and hassle than buying a new bigger one. Plus one day if you decide to sell the house it would be quite a price booster. Of course the building of an extension is not so easy. First you need to get an approval from an engineer just to make sure that it will be a solid building and will not collapse. The rest you can leave in the professional hands of EZ Refurb. Our trained and experienced builders will build the extension of your dreams fast, with quality in mind and at a reasonable price. So if you’re in need of an extra room, or have in mind the best game room ever don’t hesitate and call us at 0203 5190 363 or complete our online assessment tool. One of our specialists will call you shortly to arrange the free non obligation assessment. Are you a fan of the sauna experience? If yes, here is an idea that will surely make it easier for you to enjoy the hot room. Why not build one at home? Specially if you live in a house with a big yard a sauna will be a wonderful extension to your home. Just imagine making your way through the snow during winter time just to enter that wonderful hot room and relax in piece. If you’re willing to have a sauna in your home here is what you should consider. Even before starting the procedure or buying any materials you need to pick a type of sauna. Mainly the types are two – Finish and Infra-red. The difference is in the heating mechanism, with the Finish sauna you get a classical stove with special sauna rocks that will heat up the small room. The second type is an IR heater which produces a slightly lower temperature and it’s kind of easier to operate it. The decision is personal on whether you prefer higher or lower temperatures and what your body can handle. A second major decision is where will you place the sauna. Will it be indoors – in the basement, in an old bathroom, in a locker, or somewhere outdoors for example in an old shed or will you build it from scratch. After figuring all that it’s time to purchase some materials, and of course the obvious one is wood. Now the importance here is to pick the right one. You need to pick the kind of wood that doesn’t absorb a lot of moisture because you may need to change it quite often. Another type of wood you should avoid is the one that is rich in resin because as the heat rises it will cause the resin to melt and emit strong odour that can cause breathing problems and eye irritation. A popular choice is cedar, it stays cold to touch even when the temperature rises, it has natural oils that prevent it to absorb moisture and emits pleasant aroma that can help you relax. However if you’re somehow allergic or simply dislike the odour of the cedar the best choice will be white aspen and poplar, they’re both nonallergenic and the best choice for someone who is irritated by external odours. In terms of what wood should be avoid, you will be better off without magnolia, oak, hickory, birch, elm, sweet gum and sycamore. They may expand from the moisture and feel quite hot as the temperature rises. Of course to keep the hot inside where it should be your sauna will need proper insulation. This is usually done by using conventional fiberglass insulation batts. When you’re looking for the right insulation check the “R” symbol on them. For the walls you will be okay with an “R13” while for the roof you need to go for “R22” to “R26”. To make things easier you can just use two layers of “R13” for the roof. That way you will not have to buy different types of fiberglass and you will have two layers rolled in different directions which is better for strength. After the main construction is done, it’s time for the final touches – some wiring, the benches, lights, the door and of course the heat source. The door can be made either from the same wood used for the sauna or from a special thick glass. For safety reasons it should always be opened outwards. It is not such an easy job doing one plus it’s really recommended to buy one made of glass because, specially if you don’t have windows it will bring some light inside and provide a fresher feeling. Remember that depending of what heat source you use some wiring may be needed before the entire construction is made. It should be a bit more complicated when it comes to infra red heating but nothing ordinary skills cant handle. When it comes to the classic stove with stones, all it takes will be a power cord. So those are the basics about building your own home sauna, of course depending on the exact type you choose there can be several adjustments and additions and it is not such an easy job as well. And if you still want it but without all the hard work and lost time you can call a professional building company like EZ Refurb to build it for you. With their carpenters and handyman you will have your dream sauna in no time and without even lifting a finger. It will come at an affordable price as well and exactly as you want it to be. So if that’s what you want just pick up the phone and let the professional builders take you in the world of total relaxation. 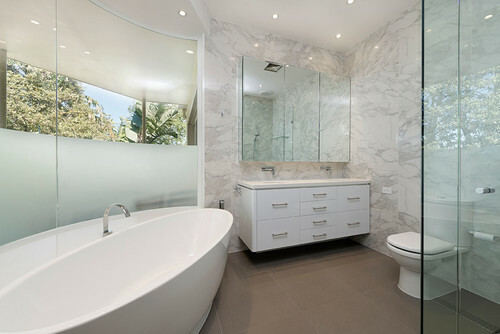 Looking to renovate your bathroom? 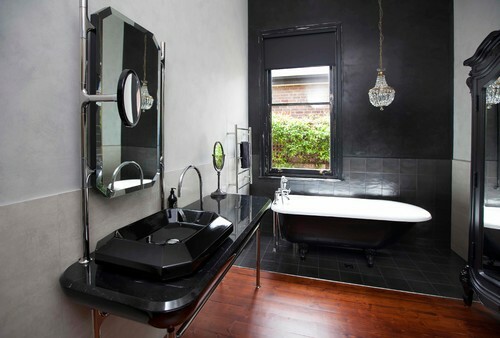 In this article we are going to explore some of the new and most modern bathroom design trends. According to studies an average person spends around 2 years of his or her life in the bathroom. That is a lot of alone time spent in one place. If you are tired of looking at the same view each day,this year is a good time to make something new and modern out of this everyday space. The bathroom is a typically small room in the house, but that does not mean it should come with an uninspired, boring design. A well made bathroom décor will make you feel comfortable and happy, while doing mundane things like brushing your teeth or taking a shower. The bathroom vanity unity is one of the pillars of bathroom design. It has evolved to be both stylish and convenient. Recognizing its significance, designers provide us with a wide array of designs with unique looks. One of the designs gaining more and more popularity recently is the double-sink vanity. Whether it is shared by a family or roommates, the double-sink vanity design gives more room for personal care. We see the bath and shower separation more and more, especially if you have more space in your bathroom. Freestanding bathtubs can be made of different materials – the most common (and best looking) being acrylic, steel and stone. In the past they were most commonly in white, but lately a color revolution has taken place, with the biggest trend being in black and white, creating a wonderful contrast and luxurious atmosphere. This year notes the biggest variety of tiles available at specialized stores. Different colors, sizes and shapes converge to make your bathroom unique and customized according to your taste. Be it just the floor or both walls and floor, the different design options are limitless. Everything in the bathroom is changing and lights are no exception. LED technology is getting increasingly cheaper and is being incorporated in more and more homes. 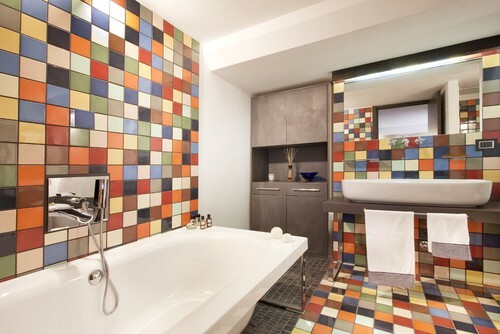 Using it, you can achieve colourful effects and localized lighting that give a special ambiance to your bathroom. Increasing number of people are trying to distance themselves from the industrial look of the standard bathroom. People are incorporating modern designs to achieve serenity and sync with nature in many ways. Be it using timber and stone or having plant life in your bathroom, achieving a calming vibe to this everyday space can rejuvenate and invigorate you for a brand new day. These are some of the latest design trends in bathroom furniture. I am sure you have much to share, so do not be shy and sound off in the comments below! Let us find the perfect bathroom! If you intend to make construction adjustments within your property, it is highly recommended that you use the solutions of a construction company. It is very important that any building work on your property is meticulously executed, mainly because this determines the probability for more concerns in the future. Receiving a quote for the task you plan to have on your property from a construction company is highly advised in order to get an estimate and compare it with the budget that you have in mind. We strongly suggest that you look for certain qualities in each company that you are going to potentially hire for the construction task at hand – such as reliability, experience and last, but not least the price tag. Finding the right company for any variety of services is troublesome, but if it has a lot of experience in addition to good reviews, it is highly probable that you have found a good one. After you receive the rate for your project from the potential contractor we advise that you don’t make your decision right away on the one with the lowest rates. Depending on the magnitude of the project we advise that you have two or even three independent assessments in order to find the company with the best experience / reputation / price ratio. Most of the building companies in London supply very close competitive rates making it difficult for individuals to choose. It is essential that you have confidence in the builders you hire for your construction project. The ones that are trustworthy and skilled generally have a good reputation on forums, blogs etc. Taking enough time to search for the appropriate handyman is a necessity, if you want to get the top quality services you’re looking for. The builders you are going to employ ought to be not only friendly and professional, but also to listen to the ideas that you have for your home. A good builder not only understands the ideas of the owner, but he also improves them before they get applied in practice. It is not advisable that you hire people lacking enough experience to perform construction work on your property just because they quoted the lowest price. In order to have the best results possible you should try to find a handyman who understands your desires and will put them to practice easily and without compromise in quality. If you desire to get affordable building solutions, then you will see how quick it really is to do so inside London. Looking for recommendations of building companies on the internet is what countless individuals choose to do in order to accomplish superb final results. Obtaining information along with facts about a specific developer, building company or a handyman is simple in our modern society with the search of blogs and online forums. There are a lot more building companies and professionals in a big city like London compared to the smaller ones, so you will have to choose wisely, having in mind our recommendations for the three most important pillars – experience / reputation / price. A lot of home owners envisage a tight spending budget for the building projects on their real estate and they choose to hire the contractor with the lowest rates, but in our modest opinion that is not the best approach. Buying a property is something wonderful, especially if it is your first one. Some people don’t get the chance to buy a new home of their own for their entire life, so if you have the opportunity to actually have your own place and turn it into a home, then do the best you can. It is pointless to say that every house has some issues that can’t be spotted on first sight, but here are some points that everyone can check and that shouldn’t be left out on trust alone. As silly as it sounds, one of the mandatory checks that need to be performed is to check all the drains. The thing is that at a certain point between the house and the sewer there might be a backup. It can be anything from a dead animal to dirt from leaves or fallen branches. It is usually not a major problem, unless you flush a vast amount of water. In order to check the drains in a proper way try to run all there is at the house at the same time. If everything flows properly, you will know that a flood is not on the horizon any time soon. The next useful tip is to go around the house and open each window. Window replacement doesn’t come cheap and it brings a lot of headaches like plastering and painting all around. Inspect carefully if any windows are stuck or worse, broken. This is a pretty common issue especially with old wooden windows. Another piece of useful advice is to light a fire in the fireplace, when there is one. This may seem a bit odd, if you’re purchasing the property in the middle of the summer, but it can save you a lot of money and problems in the future. Although the chimneys are usually built by professionals, there are some cases in which they are not in pristine shape and the very least they need is some proper cleaning before the winter season. Next in line, drink a bit of tap water. Quite often pipes in some of the old houses tend to add a little something to the otherwise clean city water. If this is the case, you can at least try to lower the price of the house or to ask the seller to install a proper filter. After all, even if you don’t drink tap water, you still use it on a daily basis and a rusty one just won’t do. Having sorted these issues, now you can focus on electricity. The easiest way to do it is open the fuse box and check the cables. You can’t know for sure if everything is okay, but one quick view of the cables will paint a certain picture. Look around for any loose cables or ones with destroyed insulation, as this is always a hint that something in the electrical chain could be wrong and it is a good idea to call an electrician to check it out. Having done that, you should now try out the heating and cooling installation. Take some temperature measuring tools just to be sure that when the time comes, the climate in your home will be just perfect. Last but definitely not least, check out the flooring in the house. If there are carpets installed, remove them (or at least a tiny part) to check the surface of the floor below. The best places to look should be at the lowest part of the room and, if possible, a corner. That’s the place where mould, if any, would be. Of course, there is quite a lot more to look in a house, but those are the quick basics that anyone can do and that can save quite a lot of headaches in the future. Combined, the entire inspection will not cost you more than a few hours, so invest the effort and reduce the chance of buying a lemon to minimum. What do you usually look for when buying a house? Maybe some of you have even smarter tips for buying the perfect home. Sound-off in the comments! If you’re in the process of fitting a new bathroom or simply upgrading your old one and you want to be in line with the latest Bathroom tiles trends for 2016 the article below is definitely a must.Based on several researches and a tile exhibition in the capital of fashion – Italy, here are this years shapes and colours that will make you bathroom stand out. Tiles with irrational rectangular and square forms are a big hit this year. The mixture of different geometrical shapes and sizes provides a stunning effect. 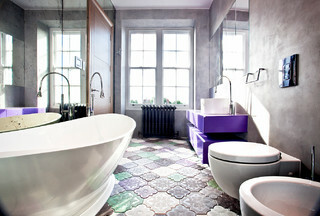 Choose the right colour and you will be amazed every time you set foot in your bathroom. Now don’t get me wrong here, I don’t mean to advice you of stripping your entire wall until the bricks show up. Instead go with the beautifully styled brick tiles. There are endless varieties of shapes and sizes but as far as the trend goes – the natural they look the better. To be honest this is quite an old style, but a classic, and with a few modern touches like the surface and the colour of the tiles it produces wonderful results. These tiles are usually easy to install and can be purchased in natural wood or stone enhancing the looks of your bathroom. The line element is in the basics of every design. This year the various variations of the straight line are reaching huge popularity amongst the bathroom tiles. Whether it would be vertical, horizontal, intercepting or 3D the effect is guaranteed to be one to remember. 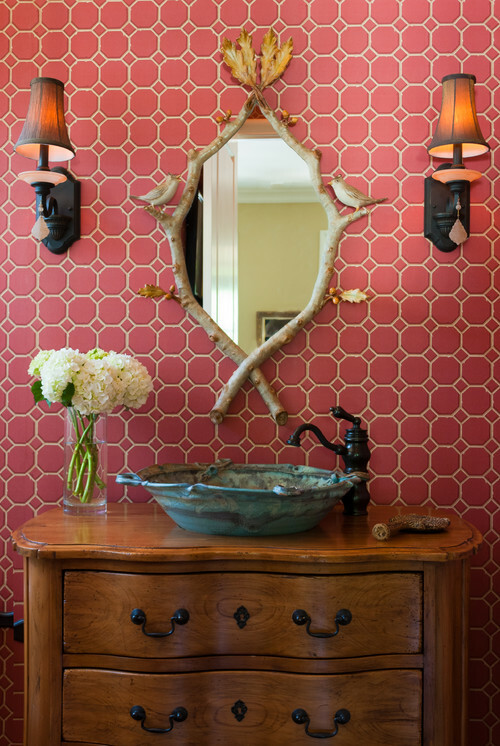 This is one trend that goes a bit more on the complicated side of things – art over tiles. Here you can choose to paint each tile in a different way or to draw a huge painting all over the wall. This would be a particularly good trend for someone who is deeply into art – the plus side you can even draw it on your own. Introduce softness and warmth into the cold world of the bathroom. This is a 2016 trend that aims at the relaxation and comfort. By tiling your walls with sandblasted marble, stripped wood or any other imperfect material that shows “imperfections” you will add a touch of warmth and softness. Some watery colours and shades can enhance the feeling as well. Tile your bathroom in greyscale – it became increasingly popular in recent years and of course there is no way that the black and white gamma can miss out on the bathroom. It would be some kind of a different world experience indulging into a room without any colour in it. It would be quite demanding for the sanitary ware as well – presumably everything inside should be Inox or similar. We absolutely can’t miss the 3D effect when it comes to our bathrooms. 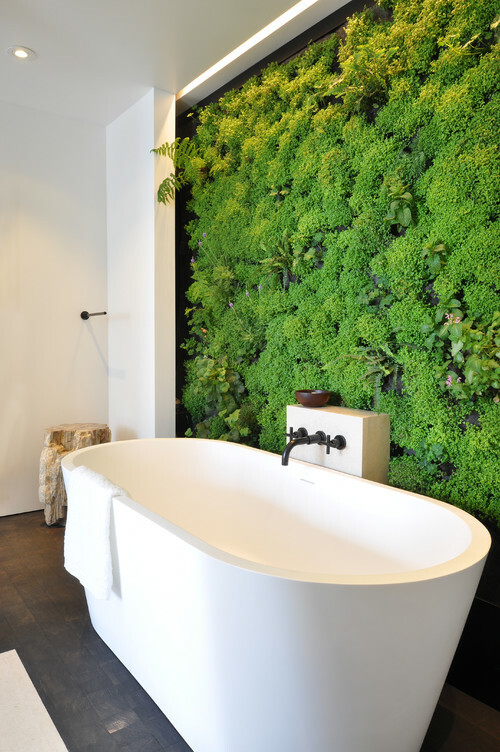 Nowadays the flat surface is kind of boring and what better way to make your wet room more entertaining than 3D walls. No superman will not emerge to the rescue, but a mixture of different shapes and sizes will definitely keep you busy while you perform your morning routine. When it comes to tiles at least. In recent years the ceramic pieces of art that we use to design our bathrooms with are constantly getting bigger and this is definitely a trend. The fewer the grout the cleaner the looks. This bathroom trend would be perfect for someone who loves the perfectly clean look. Your wall will look almost painted but with the durability and the lovely look of a tile. Here is one trend for the ocean lovers. Tile your bathroom in aquatic colours and submerge into the deep ocean. 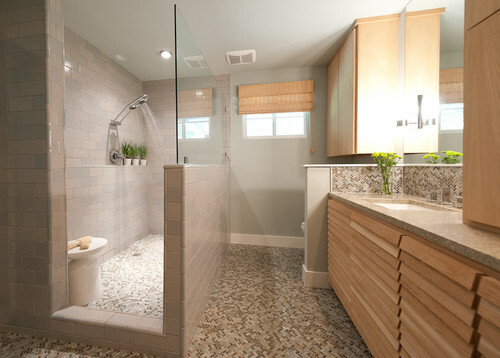 Those tiles often provide the “larger room effect” so it will be perfect for a smaller wet room. Those colours are quite relaxing and as we now know a top 2016 trend. London is one of the most populated cities in the world and as such we all expect it to grow. And grow is exactly what London is doing. The only strange thing is where it actually is growing to. Latest statistics show that home building is concentrated in the centre of the city instead of the surroundings. Based on the figures and the lack of space in the centre this would not seem logical at all, but recent investments have pushed the boundaries to their limits. And the same goes with the flats as well. The ones that are more likely to be bought are the two- and three-bedroom flats, meaning that the modern Londoner is looking for a large property in the centre of the city. Given the amount of space available in London, such properties will probably be at the high end of the price market, but when it comes to the capital of the United Kingdom there will always be a customer for a new luxury home in a top notch location, even if the price is sky high. Another study, which supports what we have already said, claims that 8 out of 10 new building projects are completed in the centre of the city, while the outer borrows suffer a decrease in building projects density. One of the major reasons behind these latest trends is the large amount of international investors who want to spend their money in the best possible way. Given that there are a lot of investors from the near and far east who are quite well of financially, combined with a lot of buyers from Eastern Europe who want to live in the centre, this is not that big of a surprise. Another reason for this development trend is the increasing number of builders that come in the UK every year. Most of them are looking to relocate themselves permanently in London and bring their families with them. And as more and more people wish to live near the centre, this increase is actually quite logical. The big question is where the extra space will be found and once it’s found what the prices of those new properties will be. Global Briefing has reported that for the last year alone new properties have been bought by people from 52 nationalities at a value of £2.2billion. At the end of the day we may all find ourselves asking where all these people come from, how come they can all afford to live in a newly built home in central London, and when the space for new properties will finally be exhausted. And the answer to all these questions is quite straightforward: As long as London is one of the most desired living areas in the world and a dream for many, people will keep coming, the amount of buildings will grow, the apartments will get bigger, and the overall expansion of this modern-day megapolis is inevitable. If you’re one of the many who want to submerge in the atmosphere of this iconic city and want to buy a property of your own, you should be very careful when choosing a place. You should plan in advance for all refurbishment works that need to be completed after the purchase and you should choose a reliable builder for the job. If you ever need one, you know whom to call. The first question to be asked here is – why exactly do we want an extension? Is it because the house seems too small, is it because the family is expanding, is it because you need a room of your own for relaxation or is it simply to boost the price of a house for an eventual sale? The extension, along with the loft conversion, is one of the top modifications that can improve your home. Pricewise it really depends on how big, well furnished and well build the extension is, but presuming that all goes well the price of your property can be boosted with thousands of pounds. The experts propose an increase of approximately 21-22% if an extension consists of for example a large double bedroom with an en-suite bathroom. The only way that an extension can add value to your property if it has the proper planning permission. In each of our properties there is a specific volume allowance. If we exceed it a planning permission is mandatory – and in order to create a proper extension that allowance will almost certainly be smaller than needed. After the planning permissions the second part of the puzzle are the building regulations. They’re mandatory if you desire to increase the value of your home. Furthermore building regulations are a must if you value your own safety as they cover a stable structure, fire exit, reasonable sound-proof and more safety features that must be accomplished in order to use the room safely. The access feature is important depending on what type of room will the extension be used. If you want to add certain privacy it will be better to add a door only on the outside of the extension. On the other side if you are going to use it as an extra bedroom it would require an internal door. To play it safe you can add both an internal and external access. Prisewise that will be a bonus to whoever plans to buy your property as he can later turn the extension into whatever he prefers. Last but not least with the extension you have the complete freedom to create your dream room – so make it worth. The exquisite the design of your new extension the better for the marketing of your home. In terms of price – the extension can prove so vital that it can be the selling point of your entire home. After discussing the layout of modern kitchens in my previous blog post, today I would like to talk in detail about how best to furnish your kitchen. Today’s appliances are energy efficient, easy to use, ergonomic and with sleek appearance. Built not only to be practical, but also eye pleasing, modern appliances are targeted to ease our ever busier lives and save us time. Although every kitchen relies on the same basic appliances, nowadays there are hundreds of different models for every different homeowner. You should carefully think and choose according to your own preferences before going on a shopping spree for appliances. 2. Dishwashers Considered a luxury item in the past, dishwashers are a common appliance in most modern kitchens. They are not only energy-efficient and quiet, but also save time for the modern homeowners to concentrate on other, more important things. Often this item comes with quite a long warranty and are built in general to last a decade, so it is very important to choose your model wisely – after all you will be looking at it for a long time. Cooktops, hobs and ovens – today these appliances are faster, better looking and more powerful than ever. Although the classic gas and electric options are still widely popular, more modern ones begin to emerge, winning homeowners’ hearts. Convection ovens – in addition to gas or electricity these ovens use fans to cook your meal faster and more evenly than ever. Induction cooktops – these modern miracles use high-frequency coils under the cooktop’s surface to heat the cookware with magnetic forces. Almost miraculously, this allows the cooktop to stay cool while heating your cookware and your meal. 5. Small Appliances They might not be considered the hubs of your kitchen, but sometimes small appliances are equally important – just ask any coffee drinker. Blenders, toasters, juicers, mixers and coffee makers are often the most used and most beloved items in your kitchen. Having enough space to store your supplies and prepare food is crucial in making your every day meal into a fast and efficient task. Modern homeowners have many different options – you can store your dishes on an open shelf or put them away in a glass-front or solid wooden cabinetry. You may also consider installing custom storage options depending on your cooking habits and needs. Whatever you choose, the bottom line is that storage is important and in order to have a modern and good looking kitchen you should look for a way to maximize efficiency in the kitchen and make the previously unused areas of the kitchen usable and easily accessible. The sink is one of the most important places in the kitchen – you will spend a lot of time over it, hovering between the fridge and the stove. Having a cramped and shallow sink can seriously curb your enthusiasm when preparing a meal, which is why it is essential that you find the right model and accessories for your needs. Faucet options include widely popular pull-down models, single and double handle versions and various finishes (stainless steal, rustic bronze or chrome). There are also high-tech models using motion sensors. Complete your desired faucet-sink pair with a garbage disposal unit and you are set to explore your cooking talents. Lighting is the most underrated element in the kitchen, but ironically it is the most hard working one. Choosing appropriate levels of lighting is not tough, if one keeps in mind that it should be concentrated where it is needed. 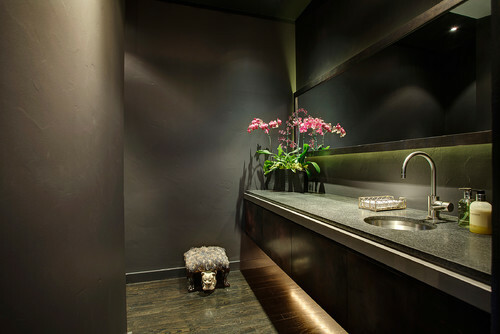 Zones above the sink, dining and prep areas must be well illuminated in order to be practical and cozy. You can choose from overhead lights, spotlights, recessed lighting and even chandeliers to make you feel right at home. According to experts, the perfect lighting scheme starts with natural light and you further supplement it by adding ambient, task and accent lighting. The most minor details can have a huge contribution to the ambiance of your kitchen. From wall colour to chairs and accessories, these are the elements that will add comfort and style to your kitchen. Choose the colour of your kitchen walls carefully. Walls with bright, lively colours create an ambiance and even appetite. Having a backsplash makes post-cooking cleaning easier, but it can also influence subtly the style of your kitchen. Using galvanized metal will add shine, or you can keep it simple by having white tiles. Families with small children even consider hand painting the backsplash in bright colours to make the kitchen appear more lively. At the end of the day your new, modern kitchen can be exactly what you want it to be. It is fully customizable and will provide an area of comfort and cosiness for you and your family. What tips and ideas do you have that you can share? I am waiting for your comments, so we can have a nice discussion about building our dream modern kitchens.